There is some disagreement among Latter-day Saints concerning humankind’s effect on the environment and climate. Although this article will not make overt political statements or analyze scientific studies on the matter, it will address what we know from the gospel about our potential to make both positive and negative impacts on our world. Whatever our thoughts about the depth of damage humankind has inflicted and what should be done about it, one thing that is crucial to understand is that our role as stewards gives us responsibility that necessitates active involvement. In Genesis, Adam and Eve were charged with taking care of the planet and everything on it. The specific word used was “dominion.” It implies control. As Latter-day Saints, we can debate about the extent of our involvement in climate change and how our actions will continue affecting it, but if we were truly incapable of changing our world, there would have been no point in God implying that we had any sort of authority over it. 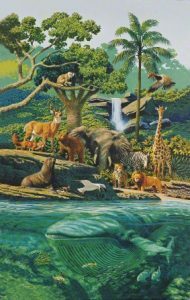 Creation—Living Creatures, by Stanley Galli. Courtesy of the LDS Media Library. Furthermore, expecting God to solve all our problems for us is directly contrary to Mormon theology regarding our purpose on Earth. We fought fiercely in a premortal war for the right to make mistakes and learn from them so that we could reach our full divine potential. This is one of the scary but necessary consequences of winning that war—we are absolutely capable of destroying ourselves. If we can’t ruin our planet, then we fought for nothing. By the same token, if we can’t save it, we have no reason to be here. Allow me to use a brilliant example taught to me by a faithful member of the Church I met as a missionary. He told my companion and me about a Christian man who warned him that he would not be saved during the chaos of the Second Coming because of his commitment to food storage. We were initially surprised, but this man’s reasoning was that God had told us to trust Him to take care of us, and food storage signals a lack of faith in that promise; therefore, anyone who has food storage would not be saved. The Church member responded by bringing up the story of Joseph of Egypt. 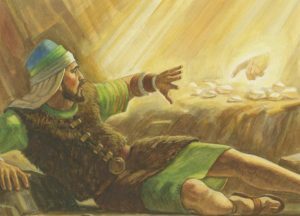 According to scripture, the pharaoh was having disturbing dreams that Joseph (through the gift bestowed upon him by God) interpreted to mean that there would be seven years of plenty followed by seven years of famine. 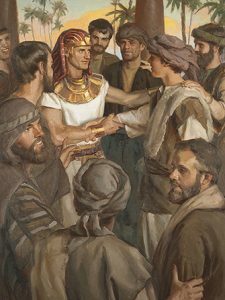 Armed with this knowledge and authority granted to him by the pharaoh, Joseph directed an effort to set aside some of the food from the years of plenty to help carry Egyptian citizens through the years of famine. So successful was this program that they were even able to feed people outside of Egypt, saving many lives. Joseph of Egypt, by Michael T. Malm. Courtesy of the LDS Media Library. Consider, too, the Book of Mormon tale of the brother of Jared. Faced with a long journey across the ocean in closed boats, the brother of Jared was concerned about how he and his fellow travelers would have light. The Lord encouraged him to think of a solution on his own, and when he did, the Lord helped him bring it to pass. 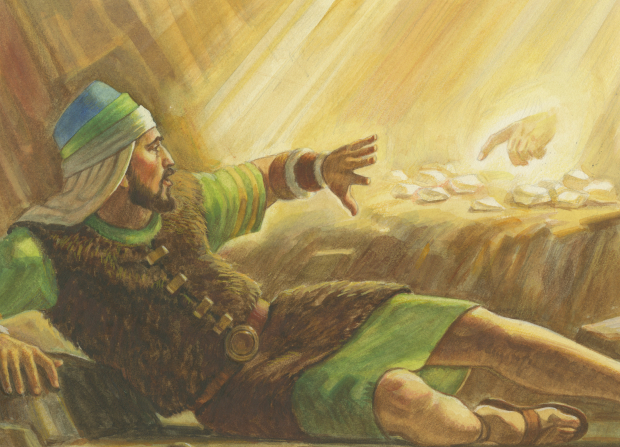 Brother of Jared Sees the Finger of the Lord, by Robert T. Barrett. Courtesy of the LDS Media Library. We do have control. We have the capacity to learn, work, and change our surroundings. God expects us to use these gifts. Through Joseph Smith, God affirmed that He will not direct every aspect of our lives and that we should not expect it. God can help inspire solutions and provide support for anyone with a desire to do good. However, He will also let us suffer the consequences of our actions. We can look to Him for guidance, and He will never abandon us, but if there’s a problem, we must be willing to acknowledge it, then actively roll up our sleeves and fix it. As we engage in political debate over matters involving the environment, we must keep these truths in mind.